Have you ever taught metaphors to 10 and 11 year olds? How did it go? Honestly. Did they get it or did they just fake it well enough to make you think they got it? Did you just give up halfway through because even though you had explained that a metaphor is not the same thing as a simile – they kept writing “like” or “as” anyway? To teach or not to teach metaphors? That is the question I have been asking myself. With only two weeks to go before the Christmas break, I was hesitant to introduce this rather challenging poetic devise to the wonderful grade five class I have been teaching poetry to this term. This clever group had successfully demonstrated their understanding of the other techniques I had introduced them to over the last 3 months (similes personification, onomatopoeia and alliteration) and had been using them frequently in their weekly poems. But I admit that in the past, teaching metaphors had proved to be challenging, frustrating and overall disappointing. Yesterday, however, I collected their poems in which they were to use metaphors. WOW! I was amazed at how well they did! Needless to say, these talented young writers have answered my question: YES – you should teach metaphors! I explained the concept of metaphor and showed them a few examples. Ralph Fletcher has written some great poems that use metaphors: “Pinball” – a pinball machine as a metaphor for high school; Poetry – as a metaphor for a sugar-crazed teenager; “Earthhead” – a globe as a metaphor for a baby’s head. I read these poems from his book A Writing Kind of Day and we discussed the metaphors. After a quick Google search the night before the lesson, I had found some other examples of metaphors. 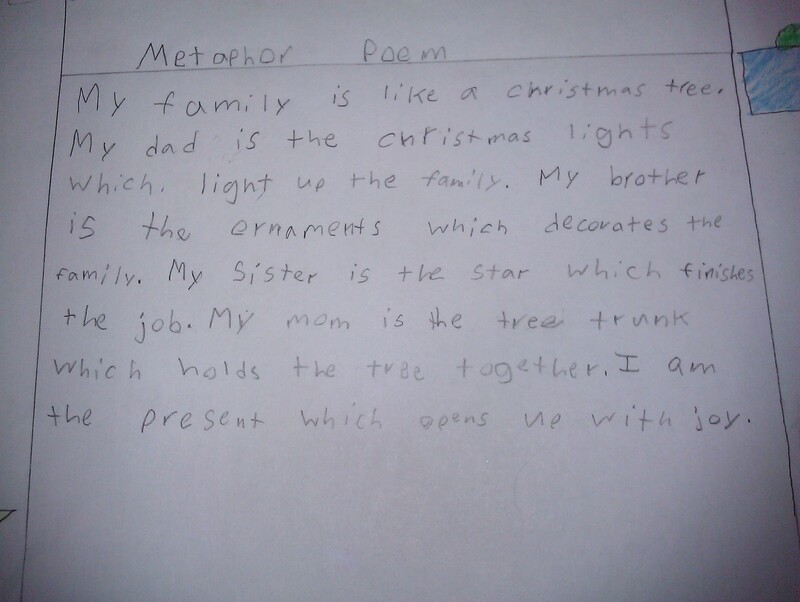 These were written by students who had used metaphors in their poems about their families. One had used the metaphor of a medicine chest, the other of the 4th of July. 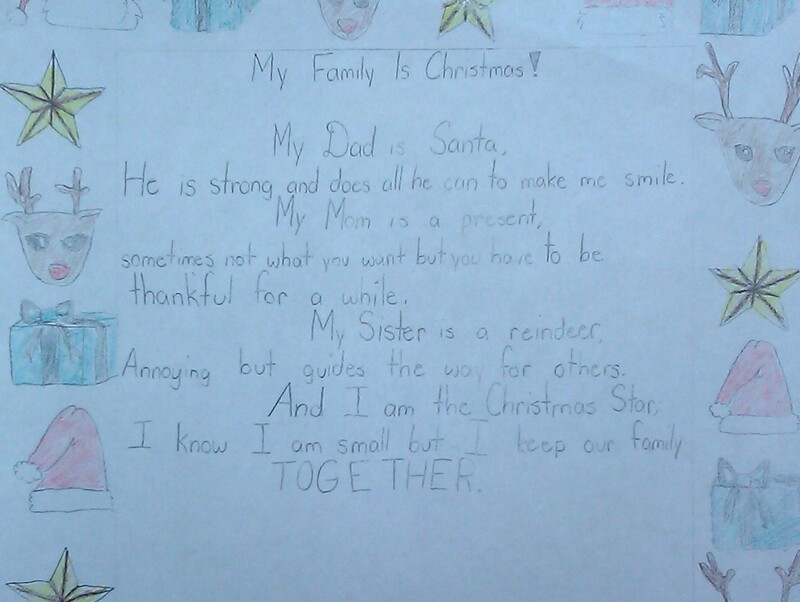 https://www.teachervision.com/poetry/literary-techniques/5453.html This gave me the idea of having the students writing poems about their families, using metaphors about Christmas. We read samples of poems and I asked the students what they noticed. 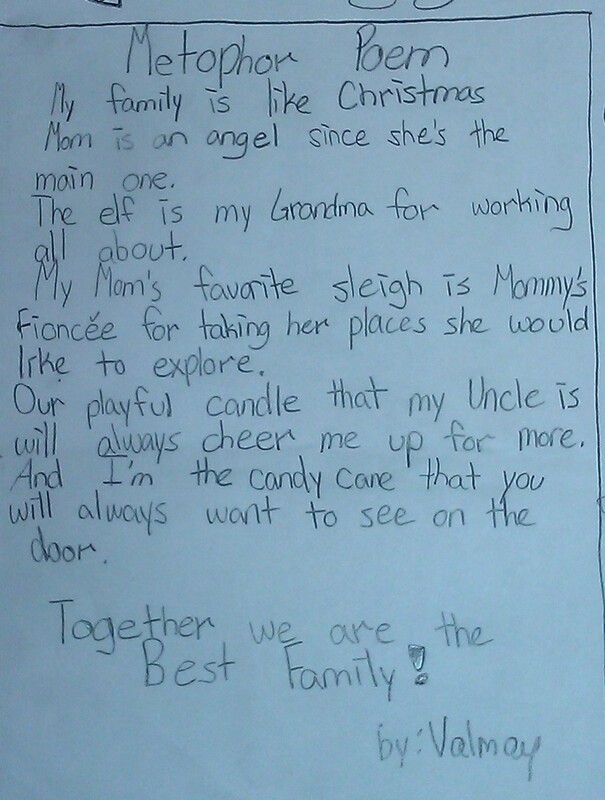 We discussed how the writer connected each family member with an object with whom they shared common qualities. We then brainstormed symbols of Christmas: tree, decorations, candy cane, star, presents, wrapping paper, tape, candle, stocking, angel, etc. 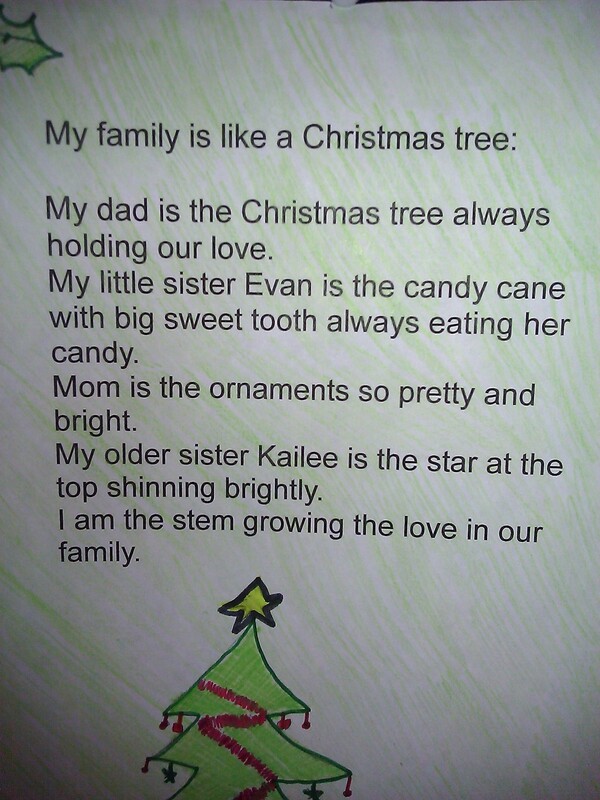 We talked about the “characteristics” of each object: ie: Tree – strong, steady, straight; candy cane – sweet, sticky, minty; star – bright, shiny. Each student then listed the members of their family down one side of a paper, including themselves. (I modeled using my family) Then I asked them to try match up each person with a Christmas object that best fits their personality or character. Beside each family member, they listed the object. Finally, they had to explain WHY or what the person and object had in common. The students thought of some amazing “metaphor matches”! I was SO impressed with their final poems – and I would definitely use this lesson again as a way to introduce metaphors. If any of your students do not celebrate Christmas, you could use the same lesson, but use symbols of New Year’s or any other cultural celebration. My favorite line from Rudra’s poem: My sister is the star which finishes the job. 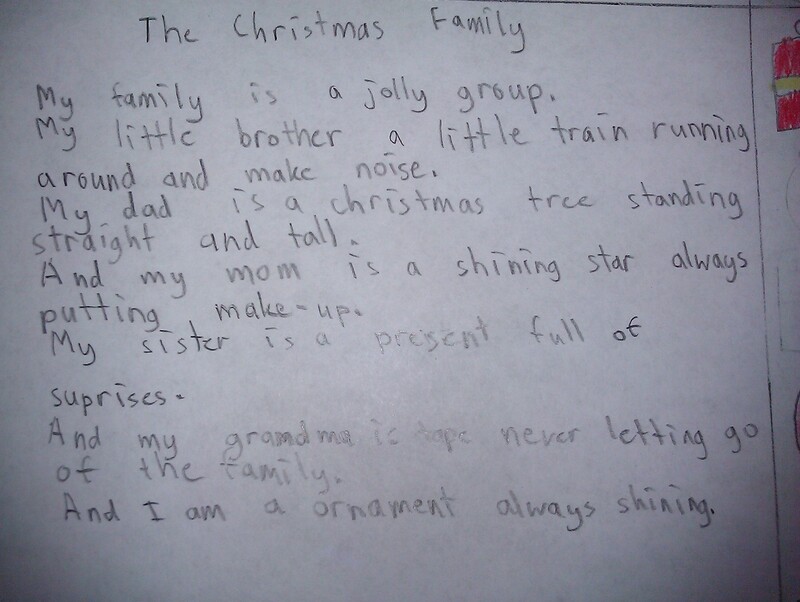 My favorite line from Reuben’s poem: And my grandma is the tape never letting go of the family. He is strong and does all he can to make me smile. Sometimes not what you want but you have to be thankful for a while. Annoying but guides the way for others. But I keep our family together. What are your experiences and ideas for teaching metaphor to younger students?